Your order will be processed promptly after receipt. If you order by 4 p.m. the articles will normally be shipped in about 48-72hours (if the ordered items are in stock). You can choose between two different types of shipping methods and two different carriers for your order. For deliveries in Switzerland and abroad (outside Europe), there are no additional charges. 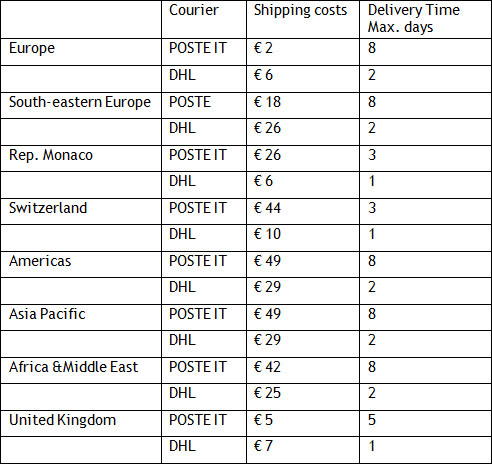 Returns of unopened parcels for Poste Italiane is free of charge world-wide. Returns of expeditions incurred with DHL incur additional costs. Please note: The express shipment can only be chosen if all the products of the order show in stock. An express shipment cannot be guaranteed any more if after the ordering assignment, some items of the order are deleted, the delivery address or the type of payment are modified or if the order is combined with another one. Moreover, the order has to be paid immediately (that means per credit card or Paypal). **Please note: Delivery times are based off of our carrier's estimations of normal shipping times once the package has left our facilities. Occasionally service interruptions do occur due to outside factors and the delivery time is extended. Receipt of Payment and Shipping: For all orders (except those by which payment by COD or by invoice has been authorized), we must receive payment before we can ship the order. Credit card and PayPal transactions normally go through on the same day, however, payment by bank transfer ("Payment in Advance"), may delay your order's shipment, as we must wait to receive your payment before we ship your order, and this sometimes takes 2-3 business days.